PhD in Mathematics at the Technion under the supervision of Professor Moshe Baruch and Omer Offen. During his studies Alexander participated in 2 international Olympiads: in 2003, Japan and in 2004, Greece. He won a silver medal in both of them. 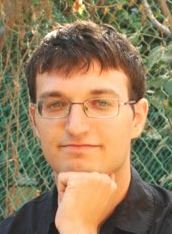 In 2005 he won the 1st place in Israel’s math Olympiad for students, which was held in Bar-Ilan. At the end of the first degree he began to study for his second degree in Mathematics at the Technion, under the supervision of Prof. Shai Haran. His thesis concerns with number theory: “Tate thesis, Weil sums and the semigroup”. Recommendation to Program participants: “The Program gave me a lot. I would like to thank all the people who take care of students in the Program. Without their support I would never be able to study so effectively. The Program gave me an opportunity to take the courses in the order I wanted, skipping prerequisites. It also allowed me to forget all bureaucratic and economical problems, and to think only about my studies. The Program also paid attention to the process of my integration into the army. Also, very important for me was the money issue. I began my studies at 16 and without the help of the program I think it would be very difficult to my family to find the money for my education. I recommend the students of the program to try to begin doing research in the end of the second year ( when you have approximately 80 points). Before this it is too early to begin research. Ask to teach some courses as early as possible. Teaching helps to understand courses material. Alexander served for 5 years in the IDF, and worked as a quantitative analyst at WorldQuant. Today (2017): Alexander is a postdoc researcher at the University of Copenhagen, working in representation theory.